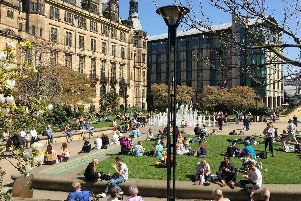 The weather in Sheffield is set to be a mixed bag today, as forecasters predict and mixture of small sunny spells and cloud, alongside below freezing temperatures and icy conditions. A Met Office yellow weather warning for ice is in place for Sheffield until 12pm today. This morning will see a mixture of sunny spells and cloud, with the temperature reaching 3C by 12pm. This afternoon will be cloudy throughout, but remaining dry, with the temperature reaching its peak of 4C by 1pm. However, the temperature will begin to dip after 3pm. This evening will become quickly dark, with the temperature dipping to 1C by 7pm. The temperature overnight will be -1C. Tomorrow will see sunny spells throughout the day, but temperatures will remain cool, with a peak of 3C and a minimum temperature of -2C. Looking further ahead, the Met Office UK outlook for Saturday 26 Jan to Monday 4 Feb said: “Changeable on Saturday with rain and hill snow clearing southeastwards, to leave a brighter and showery picture for the remainder of the weekend. “Showers will be of a wintry mix with snow possible at lower levels, particularly in the north and it will be windy with coastal gales probable in the north and west.